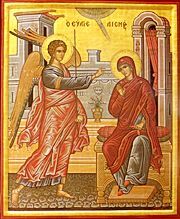 The Annunciation (or Evangelismos in Greek) to the Theotokos is one of the Great Feasts of the Orthodox Church, celebrated on March 25. Greeks also celebrate Greek Independence Day this day. This is one of only two days during Lent, the other being Palm Sunday, when fish is permitted. This date was selected by the Church Fathers to be exactly nine months ahead of the Nativity of Our Lord (or vice-versa? ), indicating that Christ was conceived in perfection at that time "of the Holy Spirit and the Virgin Mary," as stated in the Nicene-Constantinopolitan Creed. Many men and women in Greece are named for this event and celebrate their name day on this date. In Arabic traditions, the names Bechara, Beshara, or Bashar (all of which mean "good news") are used by men for whom this feast is also their name day. The feast of the Annunciation normally falls during the season of Great Lent, but it is still a joyous day. The fast is lessened, with fish allowed on this day. If the feast comes on a weekday of Lent, the Divine Liturgy of the feast is served in the evening with Vespers (in some traditions). When this happens, the fasting rules for the Liturgy of the Presanctified Gifts are followed. The Divine Liturgy of the Annunciation is the only celebration of the Eucharistic liturgy of Saint John Chrysostom allowed on a weekday of Great Lent. If the feast falls on the same day as Pascha, the resultant festival is called Kyriopascha and is celebrated with special rubrics. Presently, Kyriopascha is possible only among the churches that observe the old style or traditional Julian calendar or the Gregorian calendar (that is, Finland and Estonia). Many people make a pilgrimage as a special tribute to the Theotokos on the island of Tinos. Thousands of pilgrims jam the docks and city streets to visit the Church of Evangelistria (Tinos, Greece) that safeguards a miraculous healing icon of the Theotokos. Revealed in a vision, it was found buried in a field in 1823, and the church was built to house it. Pilgrims bring items of precious metals and other gifts to leave at the church. On August 15 (Dormition of the Theotokos) and March 25 the icon is carried through town in a grand procession. O Victorious Leader of Triumphant Hosts! We, your servants, delivered from evil, sing our grateful thanks to you, O Theotokos! So that we may sing: Rejoice, O unwedded Bride! Today is the prelude of joy for the universe! You are the beginning of salvation for all of us on earth, Virgin Mother of God. Therefore, we all cry to you: Rejoice, O unwedded Bride. This page was last edited on March 25, 2015, at 18:10. This page has been accessed 95,446 times.